This is probably the very first soup I ever made. It is very simple to make and very hearty. I have a preference for soups which are chunky. They make me feel like I have eaten something, which means I can have them alone as a meal and feel satiated. 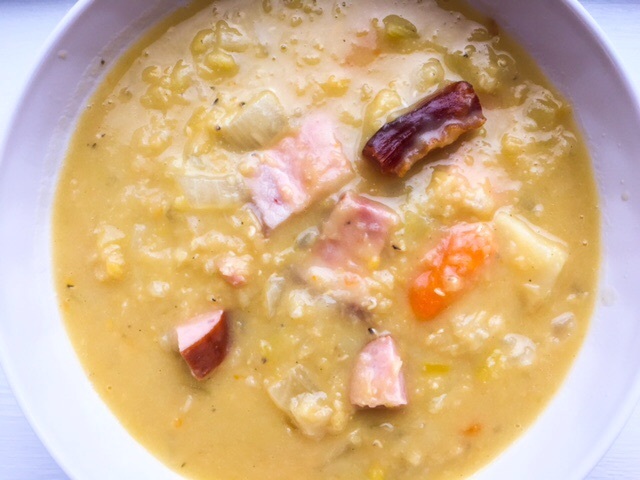 This soup is great both with ham and without it, so I have included this as an option for those avoiding meat. Although I have made this soup for as long as I have, I still have the same issue every time. I start with my large pot and as the ingredients get added, I find I quickly run out of space. When I first made this I literally had it divided between three saucepans on the stove trying not to let any of the spill over!! You could solve this problem by reducing quantities all around, but I find using half of each of the vegetables seems a bit absurd. So I persevere. What I really ought to do is just buy a larger saucepan! So, first things first, pull out a large soup pot – the largest one you have! …then grab the next largest. Just in case! Clean the leeks and then trim and chop them. Place them into the large soup pot. Peel and trim the carrots and parsnip, then chop these as well before placing them in the pot along with the pork, bay leaf, lentils and stock cubes. Fill the pot with the water and bring to the boil, then reduce to a simmer for 45 minutes. Meanwhile, peel and chop the onions. Heat the olive oil in the frying pan and add the chopped onions. Sauté until translucent, not brown. Reduce the heat and sprinkle the flour over the onions. Stir through for a few minutes, until the flour browns and cooks through. Remove from the heat. Take a ladle of the liquid from the soup pot and add this to the onion and flour mixture along with the vinegar. Stir until the mixture is nice and thick. Add this to the soup pot and continue to simmer for an additional hour – or until the lentils and vegetables are cooked through. If you are not using any meat products then stop here. Add the thyme and season with salt and pepper to taste. – Your soup is done! If you are using the pork, remove the pork from the soup and cut the meat from the bone (if using). Chop the pork into small bite size pieces. Chop the garlic sausage into small pieces and add this, along with the pork pieces, back into the soup. Add the thyme and season with salt and pepper, to taste. Return the soup to the simmer for another 5 minutes to warm through the sausage. Serve with some crusty rolls or toasted whole grain bread.